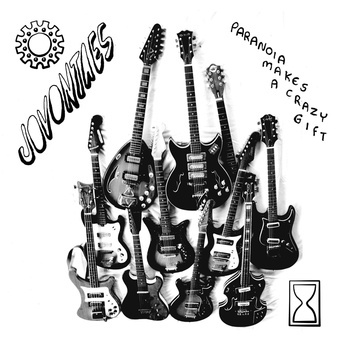 Jovontaes’s most recent release, Paranoia Makes a Crazy Gift, is yet another strong release from one of Lexington’s best lo-fi psychedelic rock bands. It starts with a rising lone tone, and then jumps into the spacey riffing and rattling of “Can’t Surf,” where it stays for a good four minutes, before continuing on its way. Track two, “Molasses,” is aptly titled – it flows around slowly, finding the band grooving along to a central tonality but ambling along to the whim of a largely improvisatory feel from the band members. This isn’t to say that the music is sloppy or that it doesn’t develop – the three play together to know when to add to the sound and when to take away, and the music here definitely has that sound. All this said, the music found on this EP is great, but it’s best heard live. You might be thinking “But this sounds pretty live to me…” And it probably was recorded that way, but Jovontaes are one of those bands that sound exponentially better when you’re in the room with them, plus it’s a ton of fun to watch them all interact with one another. It’s lucky too – the guys are playing the first leg of their tour tonight in Kansas City – but you should be able to catch them when they get back. As the album closes with “The Bend Before the End,” the guys have hit their stride and finish with a mess of noise and a final electronic whistle, and this Lexington band that many find difficult to pin down are done for now, but they’re always working on something new.